We all love to give and receive gifts, with so many special occasions coming this year I'm definitely looking to find unique and special gifts that I know my loved ones will love and cherish, and nothing is more special than a personalised gift, especially on Valentines Day. I was ever so delighted to receive this beautiful Engraved Silver Heart Pendant from GiftsOnline4U, the stunning stainless steel heart pendant comes complete with two hearts, the front heart has a cut out heart design which looks amazing, the second heart is plain which makes it perfect for engraving a special message unique to you and the recipient, when you order the silver heart pendant online you have the opportunity to engrave your very own special message. My personalised silver heart pendant has engraved Someone Special which is what my husband chose when I placed my order, I really love that I now have a necklace that not only looks amazing but it has a special message straight from the heart. 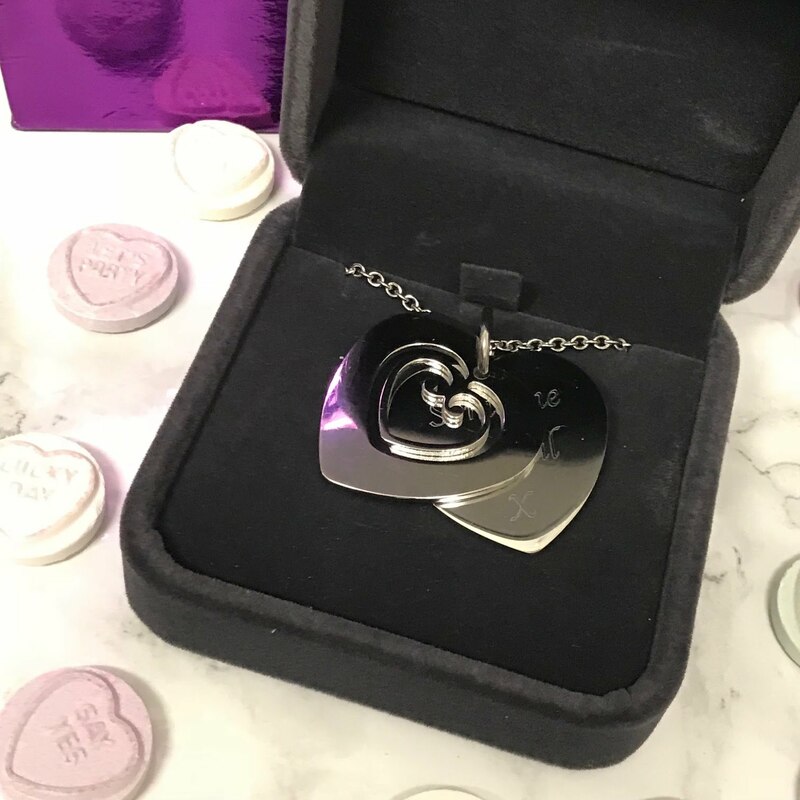 This stunning Engraved Heart Pendant came in a stylish grey velvet presentation box, you also have the option to include a greeting card and small gift bag which mean the gift will be ready to gift. This Silver Engraved Heart Pendant is the perfect gift for that special loved one this Valentine’s, birthdays, Christmas or just because they are someone special. My order arrived within a few days, but there also is the option to order next day delivery or you can opt to use the free delivery service which I did, this mean you you get your gift within 2-7 days. The personalised Heart Pendant is made of stainless steel, the pendant is approx 30mm x 30mm with the necklace length around 18in in length. I really enjoyed browsing GiftsOnline4U, the website is easy to use and navigate around, I found it really easy to select which occasion I would like to browse or whom you wish to buy for, this really helped me narrow down suitable gifts, in each drop down menu there is an array of personalised and unique gifts to choose from along with a Valentines Day gift section which will take you directly to all the Valentines products, there is defiantly something for everyone. So this Valentines Day why not treat yourself or someone you love to a personalised gift, not only will it make their day but it will be the perfect keepsake. if you would like to see more Personalised Valentines Gifts or Engraved Gifts For Her check out www.giftsonline4u.com.